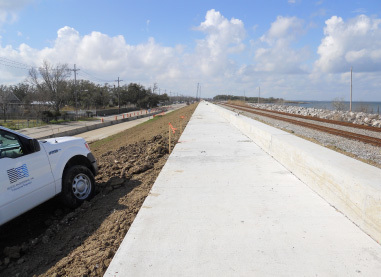 The LPV 106 project includes raising the flood protection of a portion of the existing levee along the Citrus Lakefront of Lake Pontchartrain in New Orleans East. 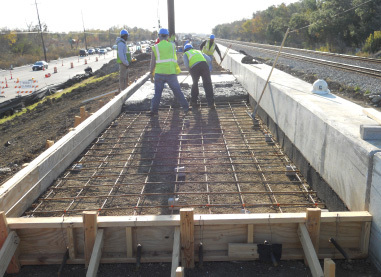 The levee extends from the existing Inner Harbor Navigation Channel (IHNC) floodwall along Jourdan Road on the west end to a tie-in with the New Orleans East Lakefront levee (Paris Road to South Point, at the intersection of Hayne Boulevard and Paris Road) on the east end. The total length of LPV 106 is approximately 21,797 feet (4.1 miles), and is divided into two reaches. Reach 1, approximately 18,968 feet (3.6 miles) in length, ties into the east end of the Lakefront Airport Floodwall and Levee Reach of LPV 105.02 and extends east to the west end of the LPV 107, Lincoln Beach Floodwall and Levee Reach. Reach 2, approximately 2829 feet (0.5 feet) in length, ties into the eastern end of the LPV 107 and extends eastward where it ties into the west end of the LPV108, Paris Road to South Point Levee Reach.